Lymphoedema is a condition which causes chronic swelling, usually of the arm or leg. It is caused when the drainage systems from the tissues of the body fail in some way. There are many causes of chronic swelling and initially, they need to be investigated by a doctor or other specialist to identify the cause and best treatment options. If it is felt that Lymphoedema treatments are appropriate a referral can then be made to the Lymphoedema Team. Skin Care – This helps to reduce the risk of complications such as infection. Compression therapy – This will be in the form of either compression bandaging or supportive hosiery (stockings, sleeves or wraps). Advice regarding exercise and positioning of the limb – To make the patient more comfortable. Massage – This may be daily self-massage or Manual Lymph Drainage (MLD) which is performed by us. Lymph taping – This uses a special kind of therapeutic tape that encourages movement of the fluid under the skin. Physiotouch – This works by using negative pressure (suction) over the tissues to help stimulate the lymphatic system to drain more effectively. 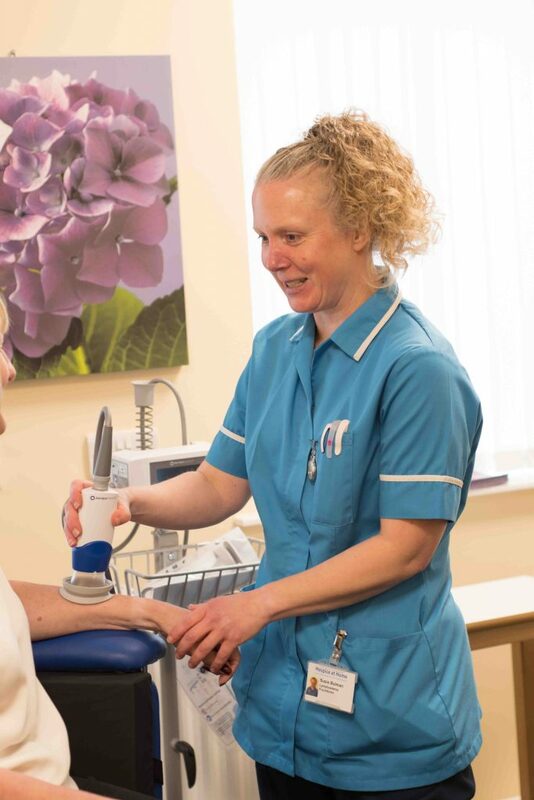 A lot of lymphoedema treatment is based around self-care and we will help patients to manage their condition with help from their carers if necessary.